Most counties in the area had an unmployment rate below 4 percent in September. The unemployment rate in Fulton County dropped to under 4 percent in September, according to data recently released by the Ohio Department of Job and Family Services. The rate fell to 3.5 percent in the county from 4.2 percent in August. Last September, the unemployment rate was 4.2 percent in Fulton County. Among the state’s 88 counties, preliminary September 2018 unemployment rates ranged from a low of 2.5 percent in Mercer County to a high of 6.0 percent in Monroe County. From August, unemployment rates decreased in all 88 counties. The comparable unemployment rate for Ohio was 4.1 percent in September. Five counties had unemployment rates at or below 3.0 percent in September. 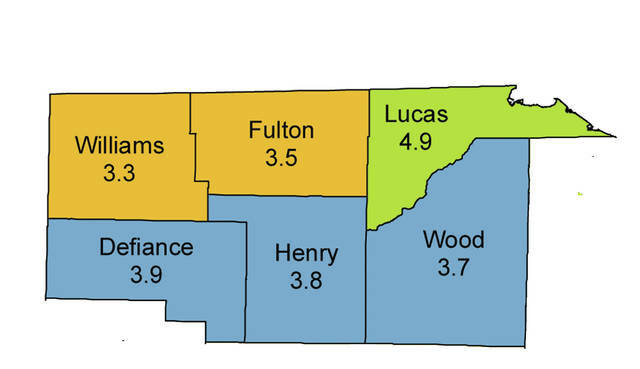 The counties with the lowest rates, other than Mercer were: Putnam, 2.8 percent; Wyandot, 2.9 percent; and Auglaize and Holmes, 3.0 percent. Seven counties had unemployment rates at or above 5.5 percent in September. The counties with the highest rates, other than Monroe were: Adams, 5.9 percent; Scioto, 5.8 percent; Trumbull, 5.7 percent; Meigs and Pike, 5.6 percent; and Jefferson, 5.5 percent. Ohio’s seasonally adjusted unemployment rate was 4.6 percent in September 2018, unchanged from August. Ohio’s nonagricultural wage and salary employment increased 4,300 over the month, from a revised 5,634,600 in August to 5,638,900 in September 2018. The number of workers unemployed in Ohio in September was 266,000, down 2,000 from 268,000 in August. The number of unemployed has decreased by 21,000 in the past 12 months from 287,000. The September unemployment rate for Ohio decreased from 5.0 percent in September 2017. The U.S. unemployment rate for September was 3.7 percent, down from 3.9 percent in August, and down from 4.2 percent in September 2017.